What Day Of The Week Is September 9? 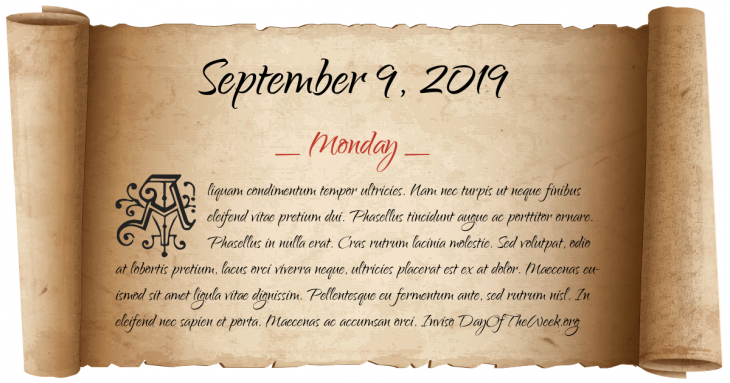 September 9, 2019 is the 252nd day of the year 2019 in the Gregorian calendar. There are 113 days remaining until the end of the year. The day of the week is Monday. Mary Stuart, at nine months old, is crowned “Queen of Scots” in the central Scottish town of Stirling. Washington, D.C., the capitol of the United States, is named after President George Washington. The Compromise of 1850 transfers a third of Texas’s claimed territory (now parts of Colorado, Kansas, New Mexico, Oklahoma, and Wyoming) to federal control in return for the U.S. federal government assuming $10 million of Texas’s pre-annexation debt. Mustafa Kemal Atatürk, the founder of the Republic of Turkey, founds the Republican People’s Party. The U.S. National Broadcasting Company is formed. In Kentucky’s Mammoth Cave National Park, a Cave Research Foundation exploration and mapping team discovers a link between the Mammoth and Flint Ridge cave systems, making it the longest known cave passageway in the world. Tajikstan gains independence from the Soviet Union. The beginning of the Y2K bug and debut of the Dreamcast. Pärnu methanol tragedy occurs in Pärnu County, Estonia. Who were born on September 9?